Context: The goal of any radiologist is to produce the highest quality diagnostic radiographs, while keeping patient exposure as low as reasonably achievable (ALARA). Aims: The aim of this study was to describe the reasons for radiograph rejections through a repeat film analysis in an Indian dental school. Settings and Design: An observational study conducted in the Department of Oral Medicine and Radiology, Manipal College of Dental Sciences, Manipal. Materials and Methods: During a 6-month study period, a total of 9,495 intra-oral radiographs and 2339 extraoral radiographs taken in the Radiology Department were subjected to repeat film analysis. Statistical Analysis Used: SPSS Version 16. Descriptive analysis used. Results: The results showed that the repeat rates were 7.1% and 5.86% for intraoral and extraoral radiographs, respectively. 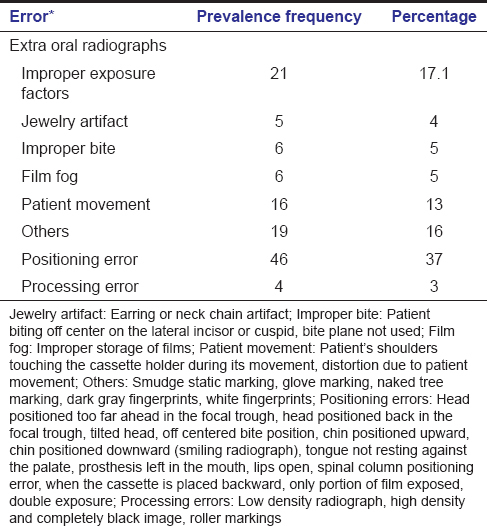 Among the causes for errors reported, positioning error (38.7%) was the most common, followed by improper angulations (26.1%), and improper film placement (11.2%) for intra-oral radiographs. The study found that the maximum frequency of repeats among extraoral radiographs was for panoramic radiographs (49%) followed by lateral cephalogram (33%), and paranasal sinus view (14%). It was also observed that repeat rate of intraoral radiographs was highest for internees (44.7%), and undergraduate students (28.2%). Conclusions: The study pointed to a need for more targeted interventions to achieve the goal of keeping patient exposure ALARA in a dental school setting. One of the basic principles behind a quality assurance (QA)/quality control (QC) program in a radiology department is that it can be a functional and practical means of tracking image quality while taking into consideration the dose to the patient. Repeat film analysis is an integral part of QA/QC program in radiology. The concern carries a significant weight in light of unavoidable stochastic effects in which very minimal radiation doses carry potential risk. Clinically, un-indicated, avoidable repeat, un-optimized examinations may lead to adverse health effects and need serious optimization. Film reject analysis is an important tool for identification of factors associated with suboptimal radiographic images and subsequent rectification. It can provide relevant information to help achieve a reduction in cost and radiation exposure to the patient. In a dental school, this information can assist dental educators to understand the QC issues and limitations within the oral and maxillofacial radiology clinic. The as low as reasonably achievable (ALARA) principle is fundamental in radiation protection that a dental practitioner can employ within his/her daily practice. This principle becomes all the more important in a Dental Teaching School as appropriate education and training of dental students will help in taking good quality images with minimum repeat rate. The ALARA principle can be difficult to achieve in a dental school setting where repeat radiographs are common. This is understandable, given that inexperienced students are involved. However, when seen on a long-term basis, the economic costs and unnecessary patient exposure to radiation can be substantial in a dental school setting. It is possible to conduct QA audit of the radiographic procedures, so that any systemic weaknesses can be rectified. The advantage of such an audit would be not only the reduction in reject radiographs and patient exposure, but also inculcating good radiographic practices among the students which would be carried over into their professional life. The aim of this study was to describe the reasons for radiograph rejections through a repeat film analysis in an Indian dental school. The objectives were to estimate the overall repeat rate of radiographs, to assess the prevalence of different type of errors in intraoral and extraoral radiographs, to assess the repeat rate of extraoral radiographs based on the type of radiographs and years of experience of the personnel taking the radiograph. Repeat film data were collected on every working day from the Dental Radiology Department over a 6-month period and included all plain films (conventional films). Intraoral radiographs were taken using Kodak 2100 intra-oral X-ray system, and extraoral radiographs were taken using Panmeca Proline 2002CC (Planmeca, Helsinki, Finland). E/F speed film-Kodak E/F speed film Kodak (Eastman Kodak, NY, USA) insight dental film was used to take all the intra-oral radiographs and Kodak T mat film was used for extraoral radiographs. All intra-oral radiographs were taken by bisecting angle technique unless specified (periodontology, implantology). Standard protocol in patient positioning and tube head positioning was followed while taking the radiographs. Rectangular collimator was used to restrict the beam to the size of periapical and bitewing films so that the radiation dose to the patient was minimized. A kilovolt peak setting of between 60 and 70 was used for all radiographs made. Radiographs were processed either manually or using the automatic processor (velopex intra-X processor, velopex, London, UK). All films were examined on a mounting desk where there was adequate and continuous peer review. All dental team members had the requisite training and credentials to take radiographs of dental patients. A log of films that were repeated was maintained. The National Radiological Protection Board (NRPB) recommended that the "dentists should assess the quality of their radiographs as falling into one of three categories." In all cases, the decision to repeat a radiograph was made by a member of the faculty and the referring doctor was consulted in doubtful cases. The "repeat rate" was defined as the proportion of rejected films in relation to the total number of films exposed. A record of date, area of interest, method of processing (manual or automatic processor), the error in the radiograph, and the cause of the error were noted. The rejected films were analyzed each day, and the reason for rejection and the type of examination were recorded. Information was recorded about the operator to allow classification into groups according to experience. These groups comprised of radiographers working full time in dental radiology; internees posted in the department for 1-week as a part of their internship program; postgraduate dentists studying for their master's degree in oral medicine and dental radiology; undergraduate dental students attending the department during their first clinical year and faculty members of the department. The errors were grouped into three main categories; personnel error, patient error, and processing error. During the 6-month study period, the observer made a note of all the radiographs that were repeated along with the cause of the error. A total of 9495 intraoral radiographs and 2339 extraoral radiographs were taken during the 6-month study period, of which the repeat rates were 7.1% (n = 677) and 5.86% (n = 137) for intraoral and extraoral radiographs, respectively. The results showed that the overall repeat frequency for the upper arch was 57% and 42% for the lower arch, and 1% for bitewing radiographs. 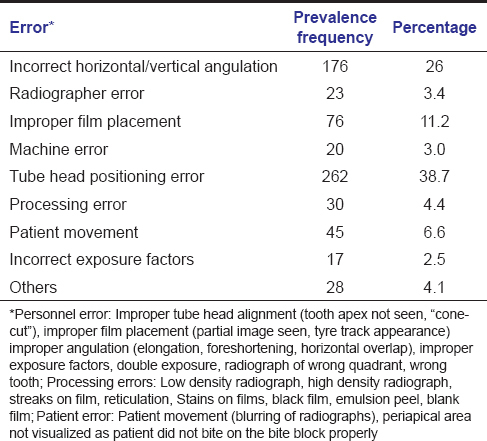 Among the causes for errors reported, for intra-oral radiographs, positioning error (38.7%) was the most common, followed by improper angulation (26.1%), and improper film placement (11.2%) [Table 1]. The study found that maximum frequency of repeats was for panoramic radiographs (49%) followed by lateral cephalogram (33%), Paranasal sinus view (14%), and other skull views (17%) in that order. 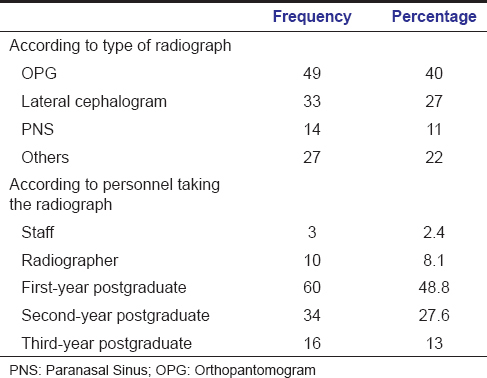 On comparing the repeat rate of extraoral radiographs against the type of personnel involved it was seen that highest rate of repeat radiographs was by 1-year postgraduate group (48.8%), followed by 2 years' (27.6%), 3 years' (13%), radiographers (8%), and the least by faculty (2.4%). It was also observed that repeat rate of intraoral radiographs was highest for internees (44.7%), undergraduate students (28.2%), and postgraduate students (26%). Staff (0.2%) and radiographers (0.9%) had the least repeat rates [Table 2]. Among the different errors seen on extraoral radiographs, positioning error was the most common (37%) [Table 3]. In our study, we found that the repeat rate reduced with increasing experience of the personnel taking extraoral radiographs. First-year postgraduates, the least experienced had the highest repeat rates and the staff and radiographers, the most experienced, had the least number of repeats. The study demonstrated that the undergraduate trainees had higher repeat rates than others. It has been assumed that the presence of student radiographers increases the overall repeat rate. Similar results were reported by Mupparapu et al.,  where it was found that re-exposure rate for the students was 4.9%, mostly attributed to faulty technique when compared to 0.2% re-exposure rate for staff members. The study was helpful in isolating factors leading to additional exposures. The study gave some gross and basic input into the common problems of quality of radiography service. Based on the findings of this study, a regular and continuous QA program can be instituted at all levels of the department for effective health service delivery, patient dose reduction, and sound resource management. Apart from the radiation dose to the public, radiographs which must be repeated, represent additional, nonbillable costs due to increased film, chemistry, and equipment use, as well as increased personnel time. Compounding the overt negative financial impact on the department is an increased burden on the waiting room and support staff. The excess chemicals and the lead foil generated contribute to the environmental pollution. The results of this study suggest that in order to achieve greater improvements in repeat rates, changes in teaching techniques should be done and teaching should pay particular attention, to the problems of patient positioning. The dental schools play an important role in providing adequate training to the students, so that they can practice the principle of ALARA. The onus is on the dental schools to teach dose reducing strategies to the students so that they will continue to use them in their practice and thus provide radiation protection to the public. It is anticipated that the data obtained from this study will be useful for the implementation of future clinical training protocols for the dental student. Like all audit tools, however, the ability to learn from one's mistakes is fundamental to make the process work. Morin RL. Objectives and rationale of quality improvement. In: Gould R, Boone J, editors. RSNA Categorical Course in Physics: Technology Update and Quality Improvement of Diagnostic X-ray Imaging Equipment. Illinois: Radiological Society of North America; 1996. p. 9-10.
International Commission on Radiation Protection. Recommendation of International Commission on Radiological Protection. ICRP Publication-60. Oxford: Pergamon Press; 1992. Wall B, Hart D. The potential for dose reduction in diagnostic radiology. Radiat Prot Dosimetry 1992;43:265-8. Watkinson S, Moores BM, Hill SJ. Reject analysis: Its role in quality assurance. Radiography 1984;50:189-94. Bolas A. Quality assurance in dental radiography: Intra-oral image quality analysis. J Ir Dent Assoc 2008;54:274-8. White S, Pharoah MC, editors. Intraoral radiographic examinations. In: Oral Radiology, Principles and Interpretation. 5 th ed. St. Louis: Mosby; 2004. p. 122. National Radiological Protection Board. Guidelines on Radiology Standards for Primary Dental care Report by the Royal College of Radiologists and the National Radiological Protection Board. Documents of the NRPB: No 3; 1994. p. 5. National Radiological Protection Board/Department of Health. Guidance Notes for Dental Practitioners on the Safe Use of X-ray Equipment. Chilton: NRPB; 2001. Adler A, Carlton R, Wold B. An analysis of radiographic repeat and reject rates. Radiol Technol 1992;63:308-14. McCauley B, McKinlay A. Spoilt films in x-ray departments. Br J Radiol 1977;50:233-4. Quality Control Recommendations for Diagnostic Radiography. Volume 1, Conference of Radiation Control Program Directors, Inc. Diagnostic Radiography, Volume 1: Dental Facilities, CRCPD Publication 01-4; July, 2001. Nixon PP, Thorogood J, Holloway J, Smith NJ. An audit of film reject and repeat rates in a department of dental radiology. Br J Radiol 1995;68:1304-7. Kantor ML, Hunt RJ, Morris AL. An evaluation of radiographic equipment and procedures in 300 dental offices in the United States. J Am Dent Assoc 1990;120:547-50. Platin E, Ludlow JB. Knowledge and adoption of radiographic quality assurance guidelines by general dentists in North Carolina. Oral Surg Oral Med Oral Pathol Oral Radiol Endod 1995;79:122-6. Tugnait A, Clerehugh V, Hirschmann PN. Radiographic equipment and techniques used in general dental practice: A survey of general dental practitioners in England and Wales. J Dent 2003;31:197-203. Mupparapu M, Jariwala S, Singer SR, Kim IH, Janal M. Comparison of re-exposure rates of intraoral radiographs between dental students and trained dental assistants in an oral and maxillofacial radiology clinic. Dentomaxillofac Radiol 2007;36:224-8. Hayakawa Y, Shibuya H, Ota Y, Kuroyanagi K. Radiation dosage reduction in general dental practice using digital intraoral radiographic systems. Bull Tokyo Dent Coll 1997;38:21-5. Horner K. Review article: Radiation protection in dental radiology. Br J Radiol 1994;67:1041-9. White S, Pharoah MC, editors. Processing of X-ray film. In: Oral Radiology, Principles and Interpretation. 5 th ed. St. Louis: Mosby; 2004. p. 105. Langland OE, Langlais RP, McDavid WD, DelBalso AM, editors. Troubleshooting errors in panoramic techniques. In: Panoramic Radiology. 2 nd ed. Philadelphia: Lea and Febiger; 1989. p. 242.